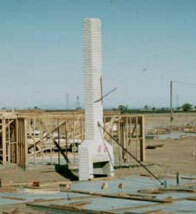 The Rampart General Pre-Cast chimney systems are a unique type of chimney. “Rampart General” is the name of the manufacturer of the system. “Pre-Cast” describes how the chimney was made. The system was manufactured in Santa Ana, California from a cast or a mold, with a combination of calcium aluminate cement and lightweight aggregate. The cast was cured and then transported to various parts of California. At the construction site for the home, a concrete pad was poured. The transport truck simply tilted the chimney into place. In some cases, the truck dropped the chimney while placing it on the pad, resulting in damage to the system. The mold or cast for the chimney structure was designed to make the chimney appear that it was constructed with bricks and mortar. To the untrained eye, the system appears to be a normal masonry system. These systems are located i n developments primarily throughout California, in homes constructed anywhere from 1971 to 1989. The chimneys (with few exceptions) will look like an off-white color brick. Some homeowners may think the chimney has been painted but in fact it is the color of the calcium aluminate cement. The chimneys (with few exceptions) will be located on an exterior wall of the home. That is because the chimney was tilted up into place. The exterior chimney structure typically appears to have a very narrow chimney above the shoulders of the chimney, much narrower than a masonry chimney. These systems can be found primarily in California although there are indications that the systems are in neighboring states as well. In San Diego County, we have found patches of them in Imperial Beach, Chula Vista, Paradise Hills, Spring Valley, Lemon Grove, El Cajon, Fletcher Hills, San Carlos, Del Cerro, Tierrasanta, Scripps Ranch, Mira Mesa, Rancho Penasquitos, San Marcos, Escondido and Encinitas. There are three major irreparable problems with the systems. If the insulation plate is cracked, there is no approved repair and the system SHOULD ABSOLUTELY NOT be used due to the high risk of a fire occuring between the chimney structure and the home. No solutions–including stove inserts, patches or relines–have been approved by the manufacturer or by the Superior and Municipal Courts of California who have made rulings in cases involving Rampart General Pre-Cast systems. According to Dale Feb of Fireplace Investigation, Research & Education Service, the leading expert in the country for this system, “Based on the manufacturers’ specifications, the ICBO evaluation report and the acceptance by the local building official of these two documents, we are not allowed to deviate from the construction, installation or repair requirements stated within these written details.” In other words, the system cannot be relined, patched and cannot have an insert installed. In the almost two decades following our training in Rampart General Pre-Cast systems, we find that approximately 60% of the systems that we have inspected here in San Diego had a cracked insulation plate. Unfortunately Rampart General, the company that constructed these chimney systems, is now out of business so there is no recourse against the manufacturer. 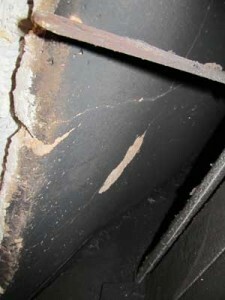 The second issue that we find is the exterior chimney will often be cracked as well. 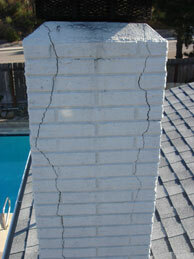 These cracks appear as long vertical cracks in the exterior chimney structure. They appear where the reinforcement steel is located within the structure. These cracks are not subject to patching and eventually the chimney will lose its structural integrity. 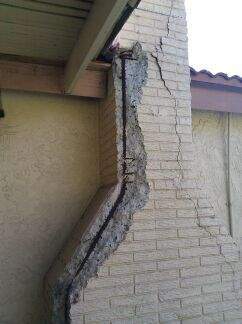 The third issue that we are finding with some Rampart General Pre-Cast systems here in San Diego is the the flue lining can be damaged or cracked. The flue lining is the passageway inside the chimney structure. 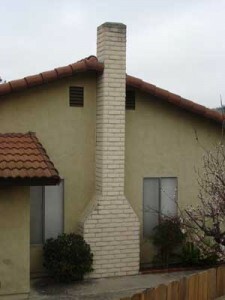 Because the system cannot be relined nor an insert installed, the chimney can no longer be used. If you are buying a home with this system, the question to ask your home inspector or chimney professional is if they have been specifically trained in Rampart General Pre-Cast systems. Not all home inspectors and not all chimney professionals have this specific training and therefore will not know about these systems. For further information, please refer to Dale Feb of Fireplace Investigation, Research & Education (F.I.R.E) Services, the leading expert in the country for these systems at 805-552-9954. Here is a link to his extremely well written and in-depth publication about Rampart General precast systems.